This is a weird one. And not terribly interesting, but a blog is supposed to be a log of what I'm doing, and this is what I'm currently looking at. Note the highlighted bit. WTF? 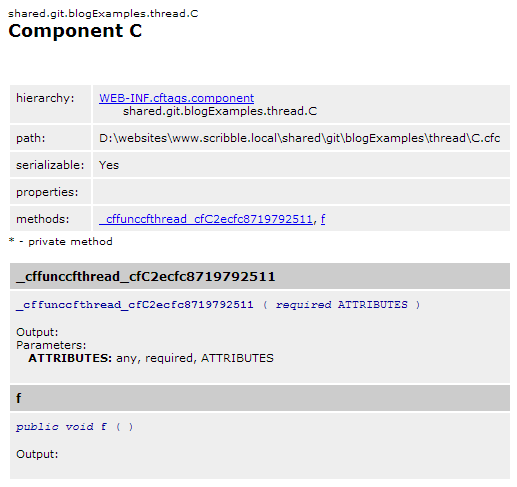 Well I can guess what it's for, it's some internal thing that ColdFusion is doing to be able to kick off the thread. If I take the thread reference out, this goes away. I'm not that enamoured with this. I don't care if CF needs to create methods under the hood to run stuff, but it should not bleed out into my code / environment. So this is a bit crap. I don't want Adobe's rubbish cluttering up my API. Also, note, that this has been created as a public method, which I really don't think is correct even if Adobe must bleed their code out into mine. And, yes, I can actually run it! As is becoming a thematic refrain on this blog "Railo doesn't behave this way", IE: it does not create spurious methods inside my CFCs. I've raised a bug for this: 3589407. Back to my day job.